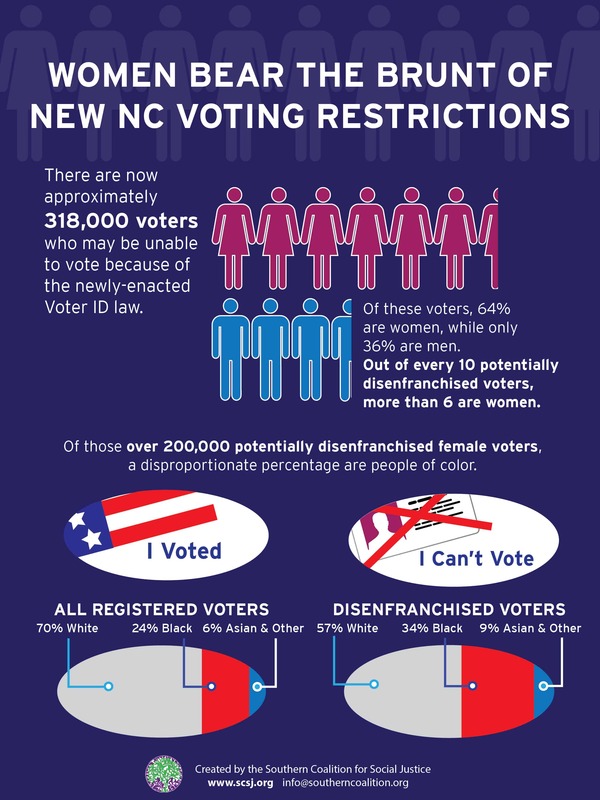 RALEIGH – The dust has settled from local elections in North Carolina, but the opposition to the state’s new Voter Law – taking effect in 2016 – continues. The law requires citizens to produce a state-issued photo ID at the polls. In a recent analysis, the Southern Coalition for Social Justice found that women make up 64 percent of the people who may be unable to vote as a result. Holly Ewell Lewis of Raleigh votes regularly, and after state lawmakers passed the law, she traveled to her home state of Pennsylvania to resolve an issue with her photo ID. The law also limits early voting, ends provisional ballots and eliminates same-day registration. The Southern Coalition for Social Justice has filed suit opposing the state’s voter ID law. Suzanne Buckley, executive director of NARAL Pro-Choice North Carolina Foundation, says making it more difficult for women to vote would impact decisions made on policies about reproductive rights and health care. “Anything that threatens to deny our ability to stand up for ourselves and to make our voices heard is a deep concern of ours,” she stresses. Ewell Lewis, who is African American, says she finds it ironic that she’s still fighting for the right to vote, just like her family did in the 1960s. “I remember thinking as a young person, ‘Wow, I wish I were an adult back in the 60s and I was able to fight for all these freedoms,’ and so here I am in 2013 getting my wish,” she says. Under the new voter ID requirement, if a person’s ID and voter registration card do not match, he or she will be turned away at the polls. Other states, including Texas, allow voters to sign an affidavit under those circumstances. The original article may be viewed here.